It's a very exciting day at Skilljar. 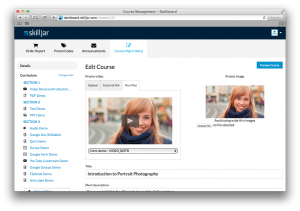 Now instructors can create new courses and lessons, upload and edit their content, and preview the final result. We're super thrilled to give more online course management tools to instructors and will be continuing to add more in the coming weeks. More information will be coming in our newsletter. Have you signed up for updates yet? Subscribe here.